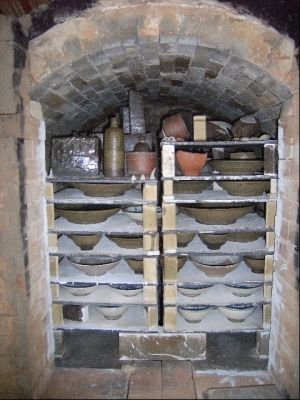 More photos of the kiln in progress. I actually finished building in mid February. More photos will be coming in the next few days. 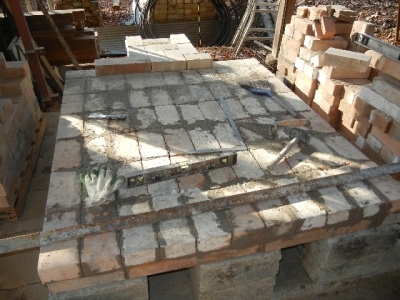 Arch form taken out and bricked up to top. 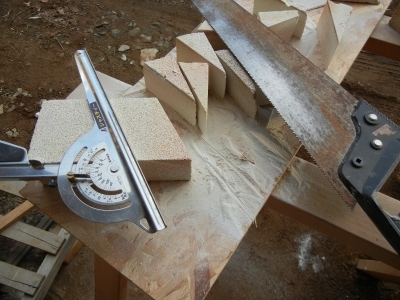 Angle bracing in place. 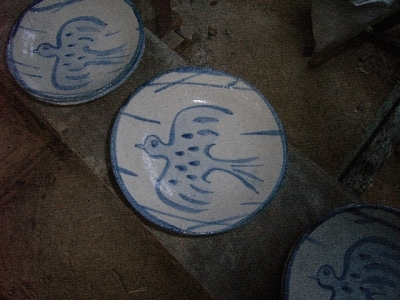 The frame is from my last kiln. 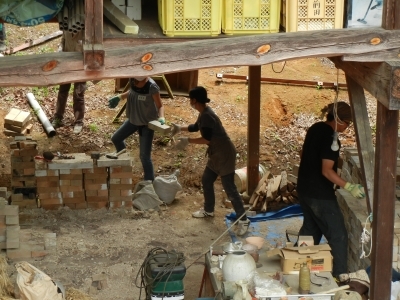 Slowly plugging along in one of the coldest winters I have experienced here in Motegi. It has been down to at least -10℃ almost every morning for a couple of weeks now. 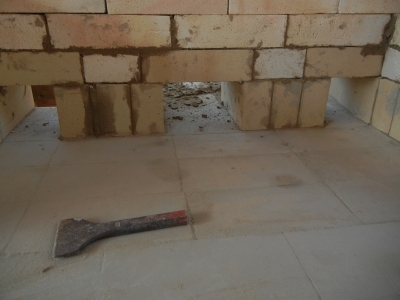 I know it isn't very cold compared to many places but it sure makes working with mortar less enjoyable. Usually it gets up to around 8℃ during the day most winters but no such luck this year, 3 or 4 at the most. 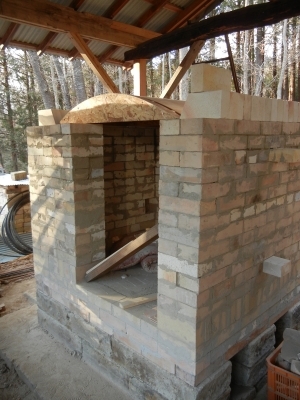 Here are some photos of the progress. First layer soldiered above the floor. I decided to make it a side loading. 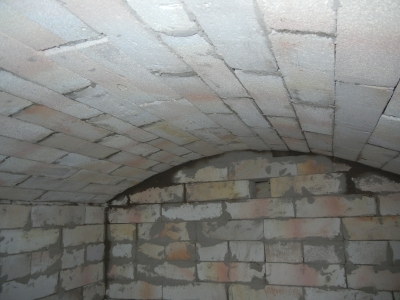 The outside wall is heavy firebrick (sk32) and the inner wall is IBF (30). 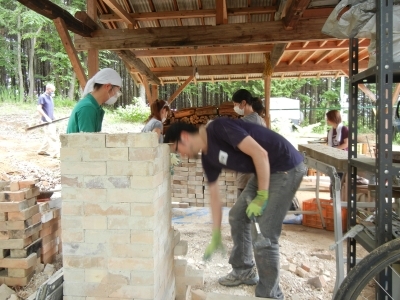 All are used bricks. I have since added several layers. About 5 more layers and the inside height will be approx. 1m. 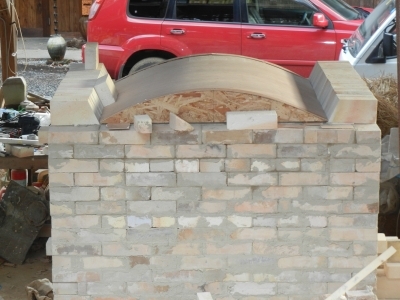 and time to start the arch. 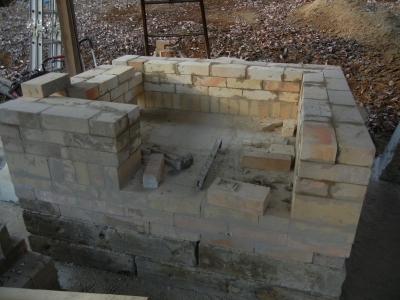 After a long summer, a 2 month visit to the US, and much indecision, I have finally gotten started building my kiln. 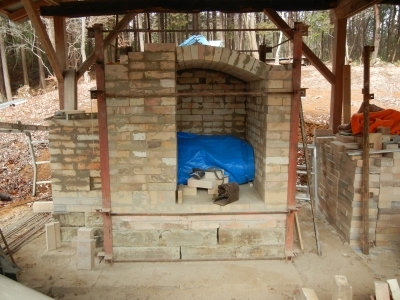 Originally I had planned on building an anagama or split bamboo kiln, but between my schedule, my poor organizational skills, and trying to pin down an available carpenter to enlarge the kiln shed roof it had to be put off till spring. 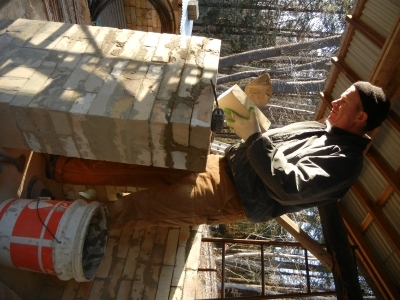 The kiln shed will get done sometime this winter. so since I have been unable to fire since March, I need something quick. 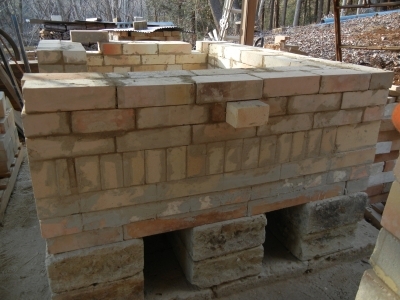 I am making a small gas kiln (approx. 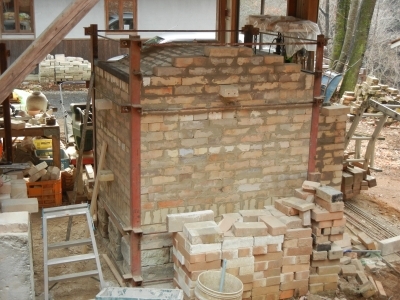 0.5 cubic meters). 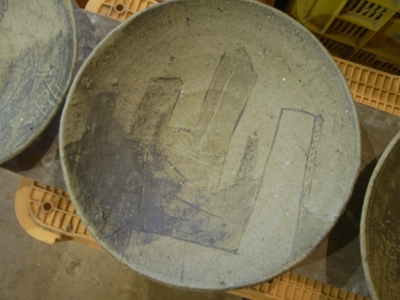 The design is similar to a MN Flat top, but with a sprung arch instead. 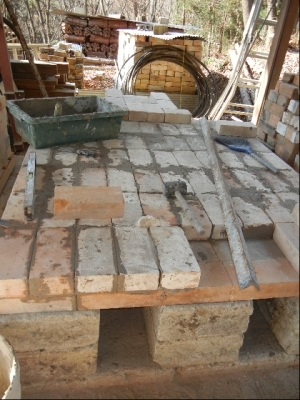 I am using used bricks. 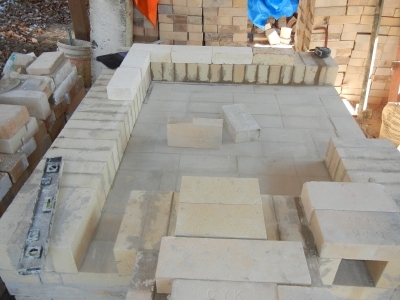 The first layer is hard fire brick (SK 32) without mortar on top of blocks made of Oyaishi, a local stone. 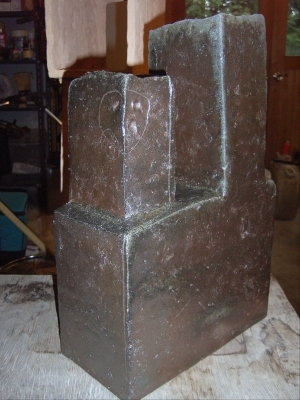 They are about 90cm x 30cm x 15cm (about 60kg a piece). I used 11. 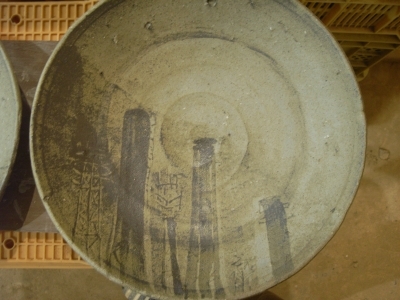 The foundation is from my last kiln before March 11. 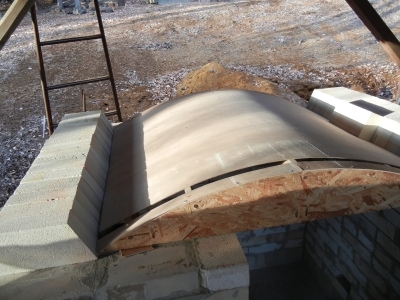 Layer 2 is insulating brick with mortar. 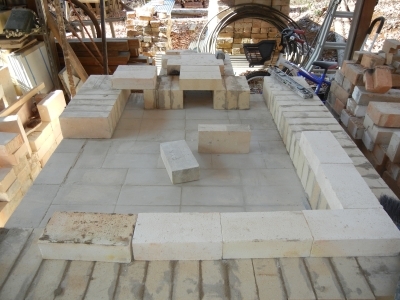 Since the bricks are used the bricks are not all the same size I needed to use more mortar than I would like to make everything level. 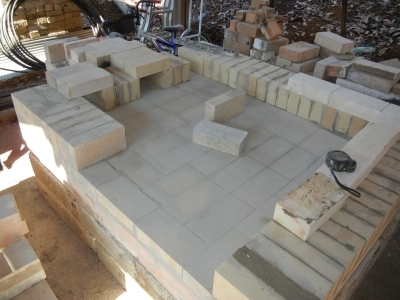 I have since started layer 3 which will be the floor (hard brick). No photos yet. 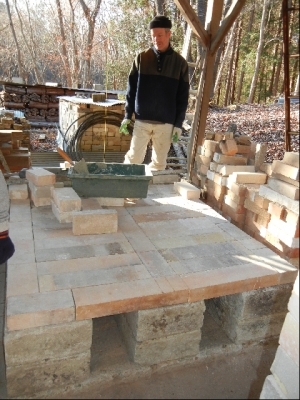 The past couple of days it has been freezing which is not the best condition for mortar work. I hope to get a little more done before the holidays get too busy. 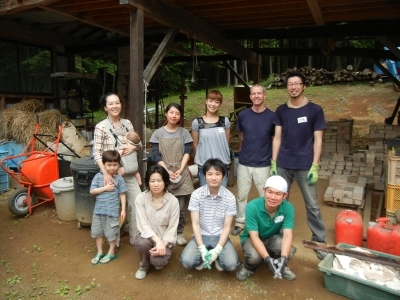 So I am ready to start blogging again after many difficult situations that have been visited upon us here in Japan. 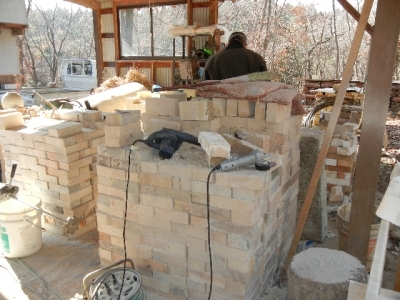 I spent most of March and April cleaning and repairing things in an around the house and workshop. 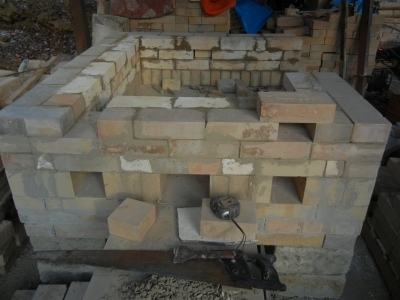 I also broke apart some damaged kilns to get bricks to build a new kiln. 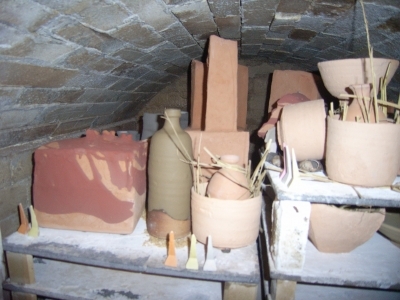 My kiln was damaged in the quake and needed major repairs. At first I thought I could get away with only fixing the arch but the closer I looked the worse it got. I decided to tear it down and start anew. 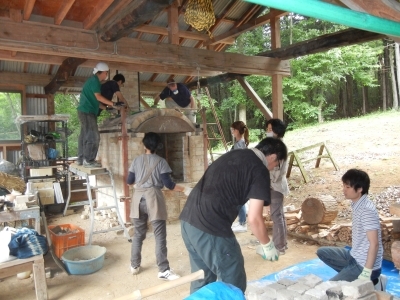 In mid-June a group of volunteers from the Mashiko Potters Relief Fund to help take it down. 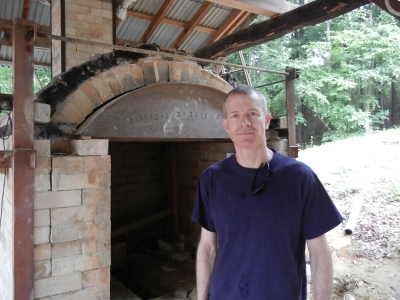 In front of my kiln before taking it down. It served me well for a little over eight years. Starting to take it down. 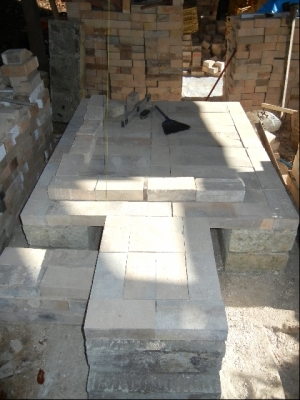 Now I just have to finish cleaning 2500 bricks (about half done) and I will be ready to start building again. 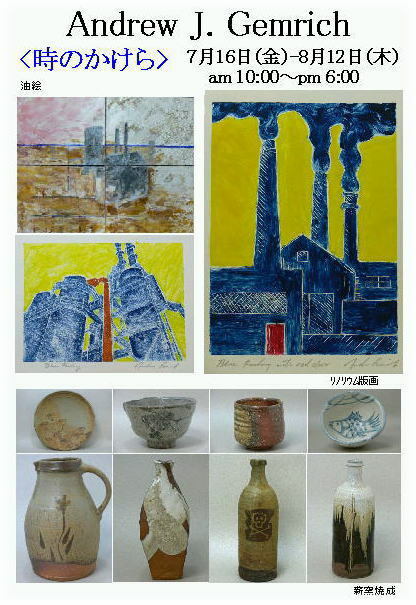 Exhibition at gallery Kai in Nihonbashi, Tokyo starts today. 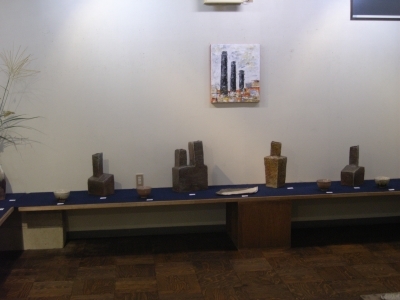 A Few photos from my current exhibition at Gallery Iwaki. 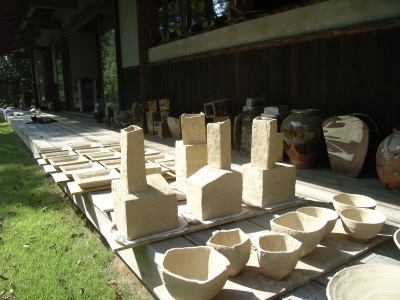 I will be having an exhibition at Gallery Iwaki in Iwaki City, Fukushima. 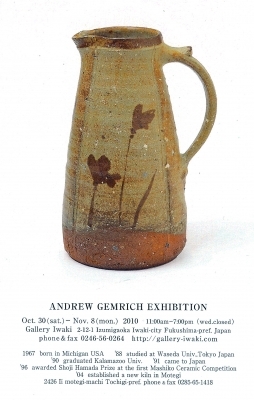 This will be my 4th exhibition at the gallery. 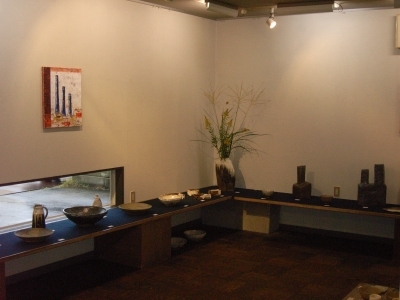 It is a very nice and spacious gallery making for a good show. I will be at the gallery on the weekends. Please come and take a look. After stop by the wharf fish market for some great seafood. 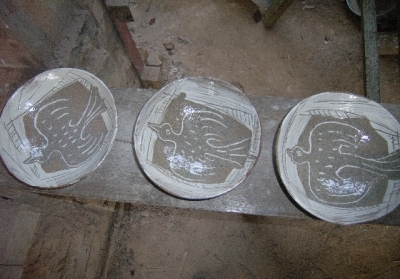 Here a few not so great photos of work from the firing last week. 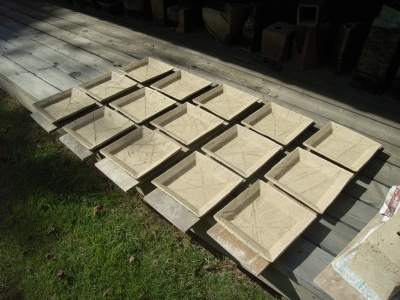 In my hurry to get things ready for my upcoming show, I packed things up and realized I forgot to take pictures. I will try to take pictures at the gallery. 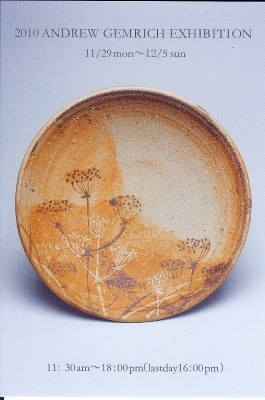 The firing was reduced a bit more than usual but not a bad firing as a whole. 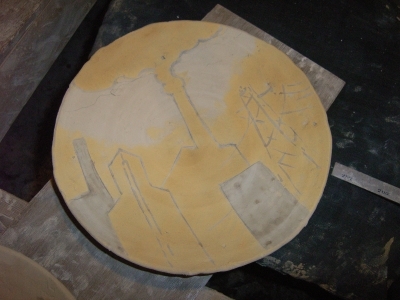 The plates with industrial factory landscapes turn out darker than I had planned but it fits the subject matter well. So I am back. After a too long and hot summer (72 days of over 30 degrees C which I avoided anything having to do with fire except maybe BBQ) I fired day before yesterday. 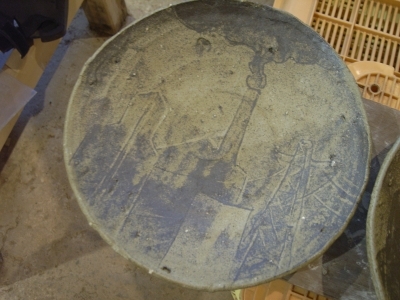 I have been continuing industrial and architectural motifs. Here are some photos. 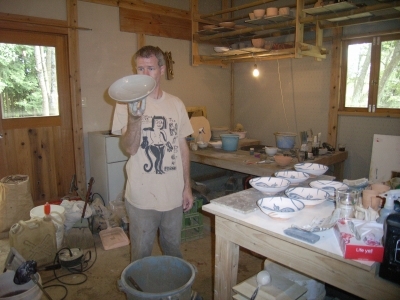 I will try to get some images of me unloading the kiln. I have the sneaking suspicion I will get some surprises. 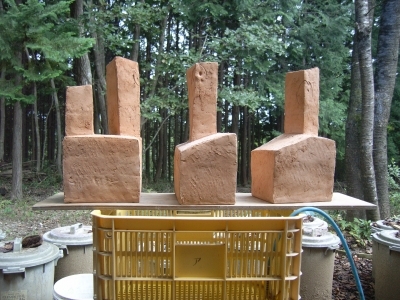 I used a lot of himalayan cedar as fuel since I could not get crytomeria (japanese cypress) and pine which I usually use. cedar burns fast and give off lots of smoke, so even trying to fire the same I don't think it did.